Please note that all group sizes are between 2 and 12 persons. Groups are accompanied at all times by a professional photographer and one or more local guides. All transportation is organized by local operators and using local drivers. We feel that our ‘discreet’ group sizes lead to less impact both on the environment and the people that we visit as well as allowing for more supervision, advice and explanations with the high ratio of guides/tour-leader to clients. 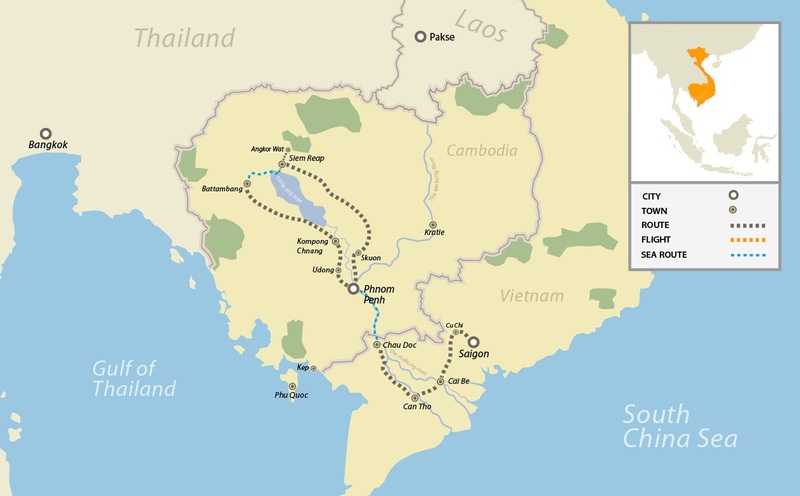 The Overland crossing (by boat) from Vietnam into Cambodia is only recently opening up so tourists are being introduced to many small towns and communities new to Western tourism. In the Mekong Delta, we encourage visits to local community craft and cottage industry - the brick works is a revelation. We also visit a plant nursery, a family rice paper business, and blacksmiths workshops. Phnom Phenh, Siem Reap, and Saigon are the places with really big touristy markets. If you're looking for the touristy souvenirs, ensure you get your shopping there. Laundry services are cheap and available at many hotels. No need to bring tons of clothes, can just get them washed during the trip. Clothing at touristy markets super cheap, also just buy new clothes. Many cooking classes offered in cities you'll be visiting, if you have free time and love the food, definitely an activity for consideration. Tipping local guides, drivers, etc. isn't required, but definitely nice to do if you appreciated their service. Ensure to budget money for this.